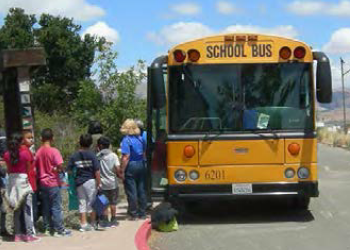 The San Francisco Bay Wildlife Society (Society) is seeking donations to make the Blue Goose School Bus Transportation Fund permanent and sustainable. The Fund pays for buses that enable school field trips to visit the Don Edwards San Francisco Bay National Wildlife Refuge as a learning laboratory. For the last two years, the Fund has enabled school groups to participate in the Wetland Round-up Field Trip (grades K-6) and Living Wetlands (grades 5 – 12) programs at the refuge. These programs actively involve teachers, adult volunteers, and students in investigating the diverse habitats and wildlife of the refuge. Hands-on, small group activities are designed to teach basic ecological concepts and to introduce endangered species, migratory birds, and wetland habitats to the students. The programs are relevant to the appropriate State of California Education Standards. The Fund was initially financed as a pilot program by grants of $1,500 each from the Connecting People With Nature Regional Funding Initiative of the U.S. Fish and Wildlife Service and $4,000 from the Society. The Society was inspired by the success of the pilot program and, seeing the value of maintaining a permanent fund to assist under-served schools with transportation costs, provided $4,000 for a second year. The program goal is to provide under-served local Title 1 schools access to meaningful programs held at the refuge’s Environmental Education Center in Alviso and the Newark Slough Learning Center in Fremont. Students from four schools totaling 240 children participated in the pilot year and funding for seven more visits from schools in Castro Valley, Half Moon Bay, Newark, San Jose, and Union City has been committed for this year. Several of the schools would not have been able to visit the refuge without the Fund’s support. Making the Fund permanent allows teachers to plan visits and coordinate their curricula with the programs at the refuge. The experience of first two years using the Fund showed that the real cost of chartering a bus and driver to safely transport students to the refuge was just over $700 per trip. The environmental education staff of the Society and the refuge can accommodate 20 Yellow School Bus funded visits annually and still maintain a high quality experience for the students. 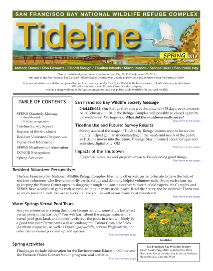 Although donations of any amount will be welcomed and valued, the Society is seeking donations in multiples of $700 from neighboring corporations, Society members, and the community of interest in the refuge: $14,000 will fund a year of visits; $7,000 will fund visits for half of a school year; $700 will enable a school visit that will change lives and open doors. Making a commitment to funding multiple years of support will help engage this generation’s young students to appreciate wildlife and their habitats. Providing support for educational opportunity in the present will enrich lives in the future. Please send your generous donation to the San Francisco Bay Wildlife Society, Attention: YSBTF, P.O. Box 234, Newark, California 94560. Donations will be recognized not only in Tideline, but also in local media and by the schools the Fund benefits.